See how SAP Concur automates and improves the travel and expense management process. Travel for public sector (excluding ETS2 customers). The yellow dots on screen highlight some of the key features of the product. Concur Travel offers multiple ways to search for flights, hotels, rental cars, and rail tickets from a smartphone, tablet, or PC. Access travel search results from multiple global distribution systems and negotiated and published fares, all from one online travel booking tool. Travel suppliers can automatically send e-receipts directly to Concur Expense. SAP Concur offers an integrated, mobile Travel and Expense solution that helps organizations manage their travel spend and streamlines travel booking and expense reporting for employees. Make travel planning, itinerary management, and expense reporting more simple for your on-the-go employees. 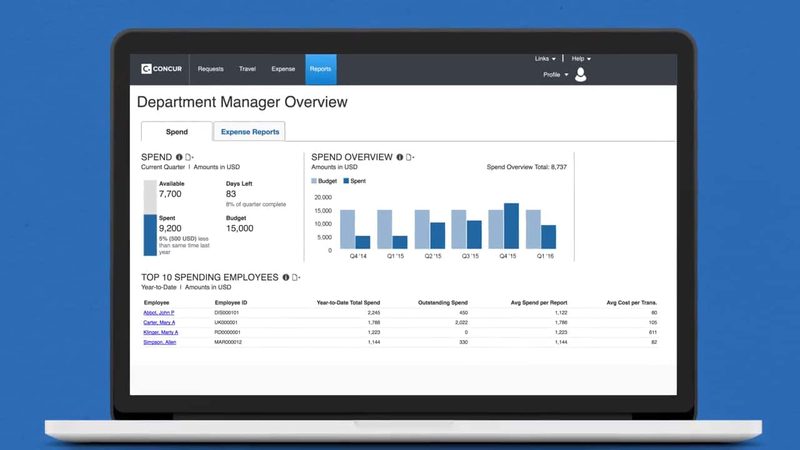 Concur Travel brings together all your travel spend data so regardless of where public sector employees book, you have visibility into how funds are being spent. Enforce travel policy regulation with Concur Request, a customizable travel planning process that enables you to approve, reject, and request changes with pre-trip authorization. Electronic receipts from airlines, hotels, car rental companies, and taxis integrate directly with Concur Expense, pre-populating itemized charges into expense reports. Integrate travel data from multiple sources, connecting you to every travel dollar spent. Consolidate your travel, ERP, invoice, and card data to eliminate manual processes. Gain complete insight into travel spending, track performance indicators (KPIs), and monitor trends for audit and transparent reporting. Keep employees safe and connected in the event of an emergency, and fulfill your duty of care obligations.